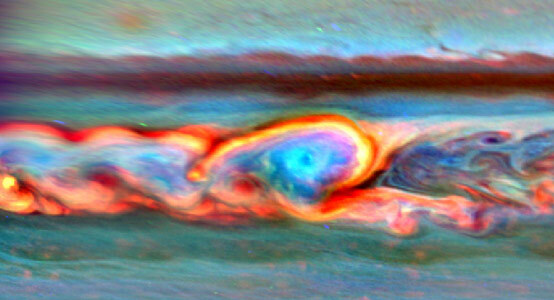 Using data from NASA’s Cassini spacecraft, scientists analyzed a massive storm on Saturn. The storm was the longest-lasting ever recorded on Saturn and it spawned the largest tropospheric vortex ever seen there. Call it a Saturnian version of the Ouroboros, the mythical serpent that bites its own tail. In a new paper that provides the most detail yet about the life and death of a monstrous thunder-and-lightning storm on Saturn, scientists from NASA’s Cassini mission describe how the massive storm churned around the planet until it encountered its own tail and sputtered out. It is the first time scientists have observed a storm consume itself in this way anywhere in the solar system. Earth’s hurricanes feed off the energy of warm water and leave a cold-water wake. This storm in Saturn’s northern hemisphere also feasted off warm “air” in the gas giant’s atmosphere. The storm, first detected on Dec. 5, 2010, and tracked by Cassini’s radio and plasma wave subsystem and imaging cameras, erupted around 33 degrees north latitude. Shortly after the bright, turbulent head of the storm emerged and started moving west, it spawned a clockwise-spinning vortex that drifted much more slowly. Within months, the storm wrapped around the planet at that latitude, stretching about 190,000 miles (300,000 kilometers) in circumference, thundering and throwing lightning along the way. This set of images from NASA’s Cassini mission shows the evolution of a massive thunder-and-lightning storm that circled all the way around Saturn and fizzled when it ran into its own tail. The storm was first detected on Dec. 5, 2010. That month, it developed a head of bright clouds quickly moving west and spawned a much slower-drifting clockwise-spinning vortex. In the annotated images, the bright clouds at the head of the storm are indicated with a red triangle. A yellow triangle indicates the vortex. This storm was the longest running of the massive storms that appear to break out in Saturn’s northern hemisphere once every Saturn year (30 Earth years). The longest storm of any size ever detected on Saturn actually unfolded over 334 days in 2009 in an area known as “Storm Alley” in the southern hemisphere, but it was about 100 times smaller in area than the latest northern storm. The Cassini-Huygens mission is a cooperative project of NASA, the European Space Agency and the Italian Space Agency. JPL manages the mission for NASA’s Science Mission Directorate, Washington. The Cassini orbiter and its two onboard cameras were designed, developed and assembled at JPL. The imaging team consists of scientists from the U.S., England, France and Germany. The imaging operations center is based at the Space Science Institute in Boulder, Colorado. 3 Comments on "Storm Spawns the Largest Tropospheric Vortex Ever Seen on Saturn"
Lord, if something like this happened in St.Louis the weather people would have to get their own channel and broadcast ‘doom and gloom’ 24/7. sounds like a planet rich in resources. a fueling dock possibly. wonderful pictures everything is everything truly.